Curried Chickpea Bowls with Quinoa | Naturally. I’m sometimes hesitant to share these types of recipes on the site. It could easily be categorized as ‘too simple’ but I’m finding as a busy family, I crave the 20 minute meals. This recipe is a solid start for more involved meals but I find it perfect as-is. A couple of notes. This recipe isn’t very saucy. I originally made it when I didn’t have coconut milk, only heavy cream. I love a bit of cream but after about 1/3 of a cup, I find things to feel a bit too rich. Of course, this recipe is also perfect with the coconut milk. Finally, I’m sure I sound like a broken record but make or find a good curry powder blend. There is great variation among curry flavors from around the world. 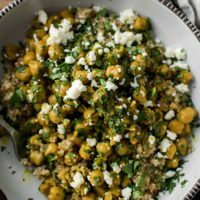 Use these chickpea bowls as an avenue to explore a few different ones. 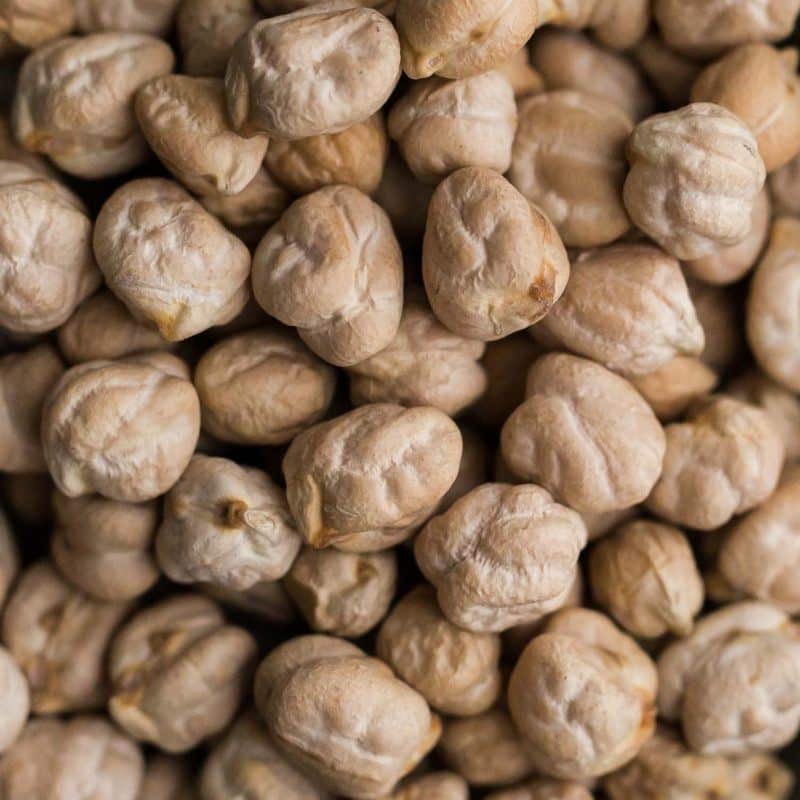 Lentils: Replace the chickpeas with cooked brown or green lentils. I like to precook a batch of lentils for these bites and then use the other part of the lentils for this bowl. 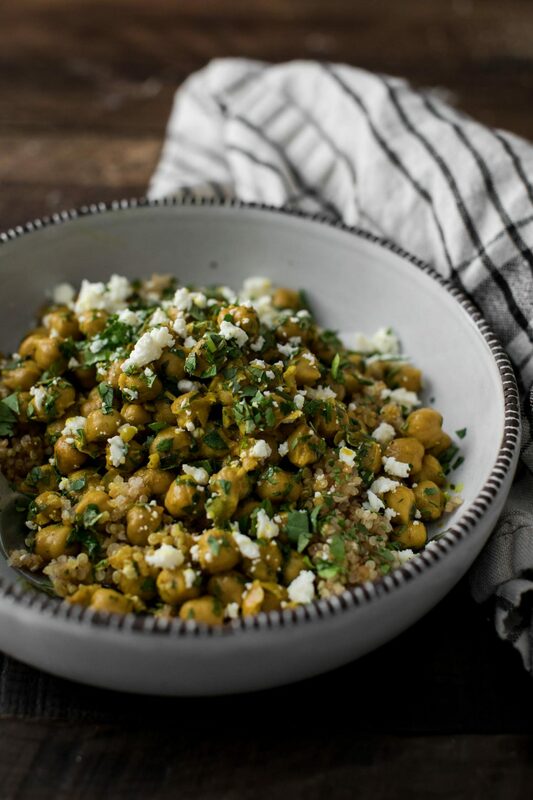 Vegetables/Greens: These chickpea bowls make for the perfect meal base. During the spring, I like to add hearty greens to the chickpeas. During the summer, zucchini and eggplant. Finally, in fall and winter I like roasted squash or sweet potatoes. Vegan: Use the coconut milk in place of the heavy cream and drop the feta. Heat a pot or dutch oven over medium-low heat. Add the shallot and cook for 3 to 4 minutes, until soft and fragrant. Stir in the garlic, cooking for another 1 to 2 minutes. Add the curry powder, followed by the cream or coconut milk. Add the chickpeas and a splash of vegetable broth or water. Cook on low until the chickpeas are hot and tender, 6 to 8 minutes. If needed, add a splash or two of vegetable broth of coconut milk. 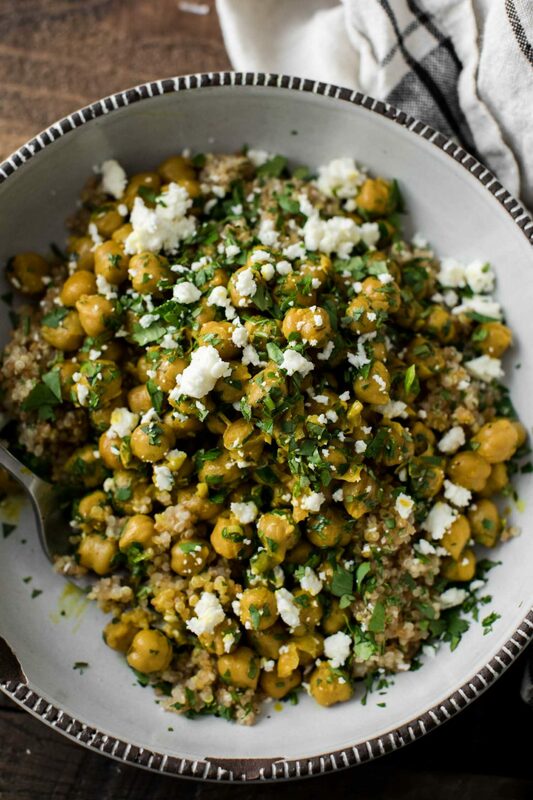 Serve the curried chickpeas over the quinoa and sprinkle with parsley/feta. Serve with lemon wedges if desired. Tips + Tricks: If you want your chickpeas to have a bit more and/or thicker sauce, use more coconut milk or cream in place of the vegetable broth. In need of more 20 minute meals? Be sure to check out the 20 minute tab on the recipe page! Very pretty and appetizing! In the old days I made my own curry powders by toasting all of the seeds and cinnamon sticks and so forth. Not any more. I typically use individual ingredients; it’s so nice that one can get them all ground now. And they can still be toasted if necessary. However, I have one “cheat” curry powder, and that is Penzey’s sweet curry powder. I might still add a little cumin to it or just use as is, but it’s wonderful. A wonderful recipe! The fact that this recipe is easy is a big plus! And I like the ability to complement depending on the desire. I will add to my daily diet. thank you for this nice recipe! please share more 20min recipes, i love it!!! I had a couple of friends over for a casual dinner and made this dish. It was seriously sooo delish. Added a tiny bit of honey and everyone raved about it and asked for the recipe. It’s also really quick and easy. This recipe is amazing! I have made it a couple of times and loved it each time! I admit, I cheat and use muchi curry powder for the curry and this is my go to 20 minute meal! I have added cauliflower/potatoes before as well to give it some variety. The chickpeas in this recipe are canned, right?